NETWORK FINALS: As we noted yesterday, the final rating for the ACADEMY AWARDS was 9.1. The LIVE FROM THE RED CARPET pre-show ratings were released in half-hour increments at 2.2/3.5/5.2. 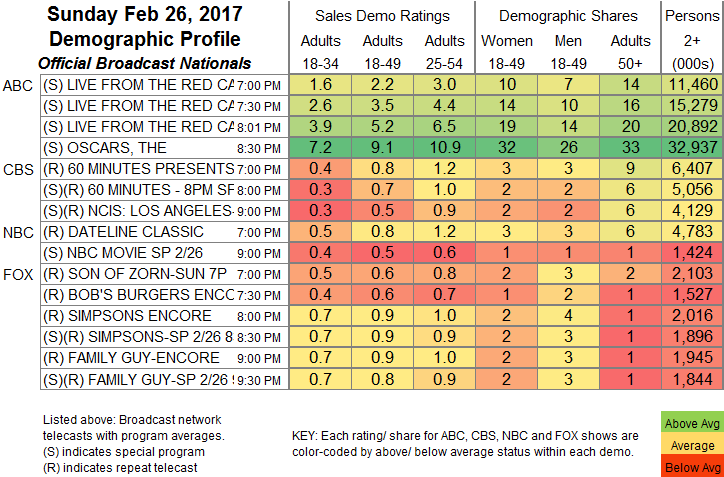 In addition, the NCIS: LA rerun fell 0.1 in final numbers. CABLE HIGHLIGHTS: The Oscars didn’t dent AMC’s THE WALKING DEAD too badly. It dropped 0.33 to 4.95, with TALKING DEAD down 0.08 to 1.74, and COMIC BOOK MEN up 0.02 to 0.38. Adult Swim’s SUPERMANSION fell a tenth to 0.39. Showtime’s HOMELAND slipped 0.04 to 0.29, while BILLIONS (previously available via streaming/VOD) was down 0.05 to 0.15. Nickelodeon’s 9AM TEENAGE MUTANT NINJA TURTLES was at 0.29. On HBO, LAST WEEK TONIGHT took a 0.16 hit to 0.27, while the rest of the network’s Sunday line-up had been made available via streaming/VOD, leaving the linear versions of BIG LITTLE LIES down 0.12 to 0.19, GIRLS down 0.08 to 0.19, and CRASHING down 0.07 to 0.10. Hallmark’s WHEN CALLS THE HEART lost 0.03 to 0.20. On Starz, BLACK SAILS ticked up to 0.13, and THE MISSING held at 0.03/179K. E!’s Academy Awards PRE-SHOW and POST-SHOW were respectively at 0.66 and 0.60. On Food Network, WORST COOKS IN AMERICA fell 0.08 to 0.53, and GUY’S GROCERY GAMES was down 0.06 to 0.41. Spike’s BAR RESCUE gained 0.02 to 0.36. ID’s EVIL LIVES HERE lost a tenth to 0.30. 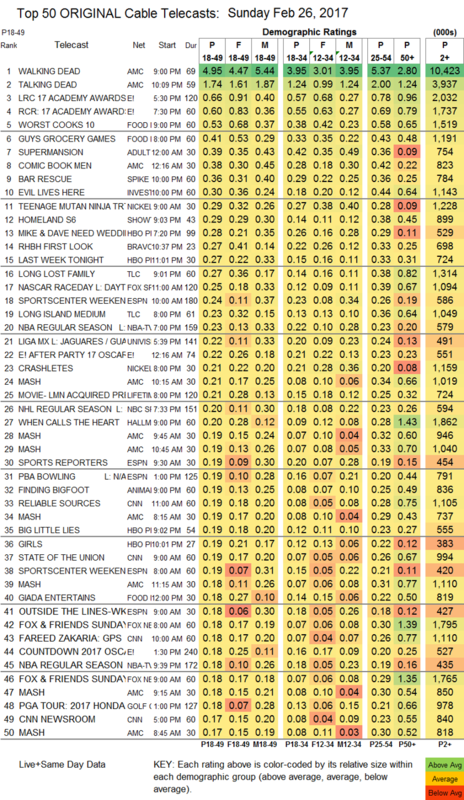 TLC’s LOST LONG FAMILY was steady at 0.27, but LONG ISLAND MEDIUM plunged 0.18 to 0.23.